The last (and first) time Matthew Weiner created a TV show, it was one of the great American works about a great American pastime: pretending. The characters in the Mad Men showrunner’s latest are bonded by that act as well: Each episode of the Amazon anthology series The Romanoffs features at least one character claiming to descend from the Russian royal family. 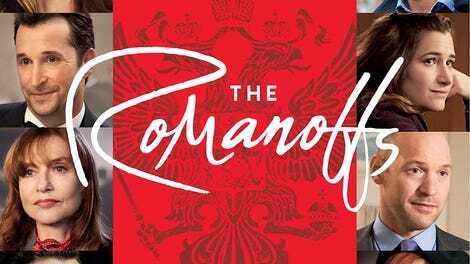 That’s a bloodline rich with history, drama, and tragedy all its own, but The Romanoffs isn’t really about the Romanovs. These eight short stories (the first three were screened for critics—the first two debut Friday, October 12, with one new installment to follow every Friday through November 23) are self-contained narratives about delusion and want, manners and consequence. It fits the refined arthouse image that Amazon is in the middle of shedding; it is sumptuously photographed, well-acted, and set against breathtaking backdrops. It is also, dispiritingly, clumsily told. The Romanoffs is a series with an uneasy relationship to plot in a format that thrives on it. It favors character, but hasn’t the time to delve into it. Technically, it has more time per episode than the average TV drama—each of the first three episodes runs longer than 80 minutes—but that rarely helps. Occasionally, the show achieves the covetable short-fiction feat of nailing a character within seconds of their introduction, as it does with the embittered, ailing, and bigoted heiress played by Marthe Keller in “The Violet Hour.” But when it doesn’t—as in the love-on-the-rocks second episode, “The Royal We”—those 80 minutes feel awfully long. The Romanoffs can prop itself up on casting, direction, and locale; within these early episodes alone, you’ll find Keller, Isabelle Huppert, Christina Hendricks, Aaron Eckhart, Kerry Bishé, and Corey Stoll, crutches other shows would assassinate a czar and his entire family for. But they’re not enough. The show is akin to the Fabergé eggs that turn up on its sets and in its mythology: gorgeously handcrafted, one of a kind, and hollow, containing only what the beholder wishes to put into them. For characters leading such brief onscreen lives, quirk is often mistaken for characteristic. Serving jury duty in “The Royal We,” Stoll’s Michael finds himself entranced by a fellow juror with an apparent murder fetish (Janet Montgomery); Jack Huston plays the method actor’s method actor in the backstage ghost story “The House Of Special Purpose.” The format calls for a certain shorthand, but some performers get shortchanged: The first episode strands Louise Bourgoin in a girlfriend role so mustily shrewish that Don Draper might as well be wrapping Glo-Coat spots around the bookends. Perhaps the feeling that The Romanoffs has bitten off more than it can chew comes from the fact that each of these first three episodes is a solid two-hander buried in faux-literary complication. The heart of “The Violet Hour” is the steadily easing tension between aristocratic Anushka (Keller) and her new caregiver, Hajar (Inès Melab). 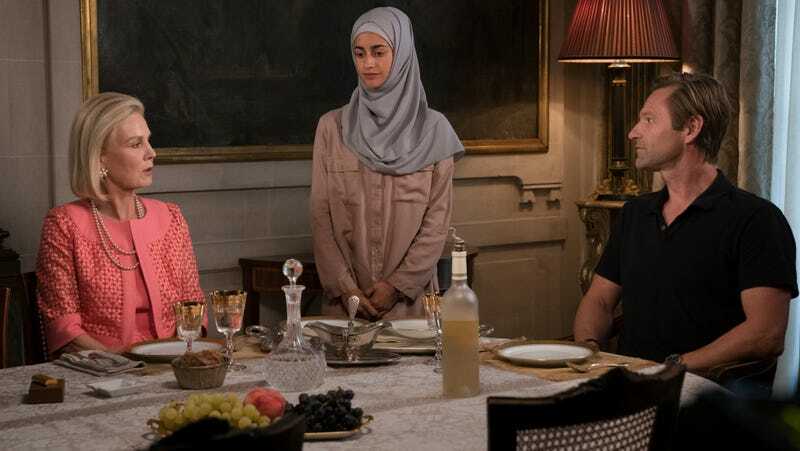 “The House Of Special Purpose” is at its most dynamic when it focuses on the head-butting and shared experiences of actor Olivia (Hendricks) and actor-turned-director Jacqueline (Isabelle Huppert). (Huppert’s casting as a manipulative on-set bully is bound to raise a few eyebrows, given the tyrannical behavior Weiner has copped to during the production of Mad Men, and the accusation of sexual harassment that he has not.) In line with the way the latter episode blurs the lines between reality and fiction, Olivia isn’t so much a distinct persona as she is “beloved Mad Men star Christina Hendricks,” making her the ideal viewer surrogate in “The House Of Special Purpose”’s twilight realm. She articulates our fear and confusion at the Suspiria-meets-The Shining vibe of Jacqueline’s shoot, eventually building to righteous “I want to burn this place down” anger when no one will explain what’s going on—or why. For all its lofty aims, some of the best stuff in The Romanoffs is that which doesn’t try too hard, and simply relies on the talented people to be talented. Otherwise, the series can’t stop itself from showing off its ambitions. If Weiner’s Mad Men follow-up going to Amazon was an early sign of an escalating TV arms race, then the final product is undeniable evidence, in every perfectly framed tableau, every picture-postcard shooting location, every stunning Janie Bryant costume. The Romanoffs is the type of show that will stage an aerial shot over the starboard side of a moving cruise ship, which feels perfectly of a piece with characters who claim a lineage of untold luxury. In Anushka’s slurs, in an exploitative (and historically accurate) royal-court pantomime performed by little people, the show demonstrates an interest in exposing the ugliness that can hide beneath that luxury. But it also revels in it, in gaudy displays of the sort its fake Romanovs all believe, in some way, they were denied. There’s something potent there, something fundamentally Weiner-esque. But it just doesn’t connect in these three episodes. And so the show mirrors its characters in yet another way: It falls short of those which came before it. There’s no call to flee The Romanoffs, not when more than half of the first season remains, with appearances by Diane Lane, Kathryn Hahn, and Amanda Peet and additional Mad Men reunions with John Slattery, Jay R. Ferguson, and Cara Buono. But their episodes should be met with tempered expectations. (Though you might as well stamp that disclaimer over the opening credits of every anthology series from throughout television history.) On The Romanoffs, you can always hope to see something grand, even if the show has yet to show us anything great.